On Monday, Bronson Arroyo pitched eight innings of three-hit baseball against the Milwaukee Brewers. With the score tied at two a piece during the bottom of the eighth inning and after allowing only two earned runs while striking out five, Arroyo made a huge mistake. With a 1-2 count, Jim Edmonds crushed Arroyo's next offering, but hooked the ball foul. Edmonds then hit Arroyo's next pitch to right-center field for his eighth homerun of the season and placed the Brewers permanently ahead of the Reds 3-2. The Reds loss to the Brewers on Monday gave them an even .500 (6-6) record since the All-Star break and placed them one game behind the St. Louis Cardinals in the NL Central. "You have past history in your head with somebody, so I wanted to go up and in and he hits it out of the park with some hook on it so he's obviously getting around pretty quick," Arroyo said. "I thought he'd be sitting soft and away. I didn't think he'd get to the ball on the inner half if I threw it anywhere close. It was a good four-seam fastball on the inner half. He won the game that time." Edinson Volquez made his third start for the Reds this season on Tuesday. Throwing 95 pitches in just 3.2 innings Volquez allowed four runs, six hits, walked four, and struck out three. Despite Volquez struggling for his second straight start, the Reds offense and bullpen came through. "I still have a problem with my mechanics," Volquez said. "My arm is good. My speed is very good. I just can't put it together with my mechanics. I'm going to start working with Bryan in the next couple of days to see if we can fix it. I have to step up and throw strikes and we need to win." Reds' relievers (Ondrusek, Bray, Smith, and Fisher) combined for 5.1 scoreless innings, struck out six, and allowed just three hits. Logan Ondrusek received his second major league win as he worked 2.1 innings (0H, 3K). Compiling a season-high 19 hits against Brewers pitching, the Reds offense was dominant. 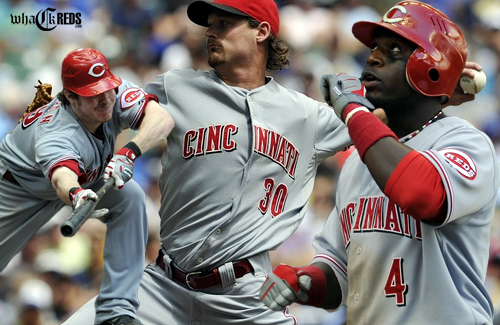 Scott Rolen, Brandon Phillips, and Joey Votto each had four hits. It was only the third time during the past fifty years the Reds have had three players with four or more hits in the same game. The Reds defeated the Brewers 12-4. "It's a shame that Volquez wasn't able to stick around and get the 'W' today," Joey Votto said. "But it was the hitters' game today. It was a good day for all of us. Three and four-hit games are rare. When you get them all in a bunch, that usually means good things for us." The Cincinnati Reds secured a series win against the Brewers and a successful 4-2 road-trip with another destruction of Milwaukee on Wednesday. During the Reds' five-run sixth inning, Brandon Phillips belted a 450-foot grand slam hitting Bernie Brewer's yellow slide in center field and Jonny Gomes notched his 300th career RBI. After the Reds gave starter Travis Wood a 5-2 lead in the sixth inning, he left the game after allowing two runs on five hits and striking out six in five innings. The Reds' bullpen (Smith, Rhodes, Masset, Cordero) was once again lights out pitching four innings of scoreless three-hit baseball. Along with elegant relief, the Reds scored five more runs during the eighth inning, and guaranteed Travis Wood (1-1) his first major league victory as they defeated the Brewers 10-2. Joey Votto belted his league-leading 26th homerun during the eighth inning. The blast stabilized a new career-high (4 in '07, 24 in '08, and 25 in '09) for the young left-hander. "Everybody did their job," said Reds' manager Dusty Baker. Currently tied with the Cardinals for first-place in the NL Central, the Reds will take Thursday off before facing the Atlanta Braves for a quick three-game home stand at Great American Ballpark over the weekend.